It's 2013, and I don't play multiplayer video games anymore. I just don't enjoy it. There's too much hostility, and too much time required to either grind levels or learn maps. It wasn't always this way, though. I was once, believe it or not, a member of an online gaming clan. And a role-playing one at that. 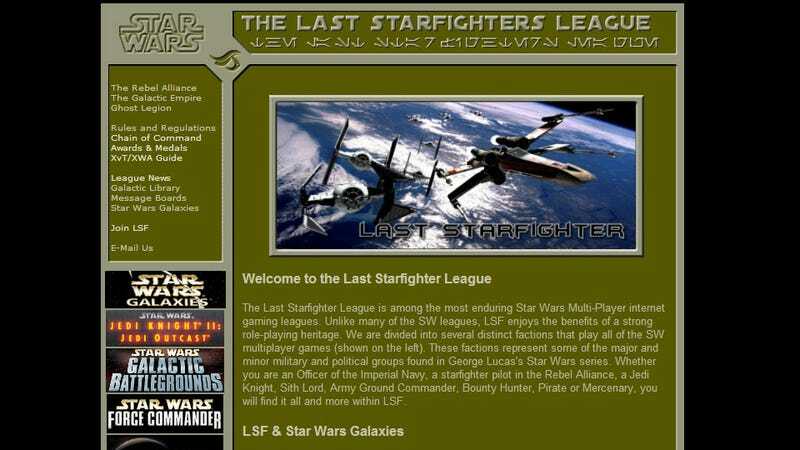 That clan was The Last Starfighters League, and despite the name suggesting otherwise, it had nothing to do with the classic video game movie. Instead, it was a clan for all things Star Wars. I joined in 1999, and back then, it was pretty much all X-Wing vs Tie Fighter. X-Wing Alliance would gradually replace it as the go-to game of choice, but basically, it was a clan for space combat (though "ground forces" titles like the Jedi Knight series were also played). And it was great. The clan was big on really getting into the Star Wars universe, so rather than just, say, picking a nickname/handle, you had to really roll your sleeves up, choosing first a faction (Imperial, Rebel or Ghost Legion), and then a squadron. Battles between factions would be recorded, fake reports written up, medals awarded, the works. Players were even encouraged to keep their in-game chatter as in-character as possible. It was terribly geeky, in a way that makes me a little embarrassed now, but I think for me—and everyone else involved—it came along at the perfect time in not just our lives, but the life of the internet. I was 19. Moving on from my high school friends, yet to really settle in with my university friends. No longer a schoolkid, not yet an adult. I was still into Star Wars and video games, but needed something more. It's easy to take geekdom, a love of something and the means of connecting with other people who love something as well for granted these days, but in 1999, that wasn't the case. There was no Facebook, no Tumblr, no blogs, almost nothing to instantly let you find people just like you and hang out with them. Games weren't connected magically through the wonders of Steam or Xbox Live. You had to use a game's own match-making or, worse, subject yourself to Microsoft's woeful Gaming Zone, which if you ever find yourself complaining about Games For Windows Live, know that you know nothing of Microsoft's ability to torture innocent PC gamers. And that was just for playing blind games. To actually meet people, you had to fumble around, find these little closed groups, gain access to them. It was almost a game in itself. And when you did, it was... weird. You couldn't look up a Facebook profile to see what someone looked like, or chat with them over Xbox Live. I spent my two years with that clan knowing almost nothing about its members but what their nickname was and what little communication we exchanged via text, whether that be in a forum or in-game. Sounds lame, and in many ways it was, but it also helped with the meta-game that was going on. You could, if only for a few hours at a time, forget that the other person flying with you was some Dad, or kid, or weird loner. He was your wingman. Indeed, my decision to leave the clan was made soon after I attended my one and only gathering at a function centre, giving me my first chance to meet and greet my comrades in arms. It was...well, while there were some cool people there, let's just say the number of sad middle-aged men present ended my ability to role-play pretty quick. In my time at LSF, I was never that great a pilot. While I'd fancied myself amazing, given my singleplayer exploits, it was my first introduction to the world of gamers finding certain rules or moves that "break" or "cheat" a game, rendering many of my tactics useless. I did, however, enjoy much of my time there, and even tried my hand at founding my own division in order to climb through the ranks. That division was a "ground unit", who would play... Force Commander. One of the worst Star Wars games ever made. So yeah, that didn't end well. About the only thing that did end well was my name, Valkyrie, chosen as a homage to the Veritech fighters of the Macross series. I thought it was a pretty obvious reference, but nope. Turns out for months everyone thought the name was literal, and that I was—gasp—a girl. You can imagine their disappointment when the truth got out. I was playing X-Wing Alliance again the other day, which prompted this little walk down memory lane, and as part of that stroll I figured I'd go and check in on the old digs, see if they were still around. Amazingly, given the site was made in 2000 (and that the clan itself is long gone), they were. At least partially. The league's main site is still up and running, and as you can see from the games listed on the sidebar, is about as perfect a snapshot of early-2000's Star Wars gaming on the PC as you can get. From that main page, several others are still working, including guides on how to join the group (you need demos!) and even the chain of command. Sadly, the real meat of the site—the forums—are long gone. As are the faction pages, which held things like medal collections and battle honours. But hey, at least the memory remains. The awkward, uncomfortable memories of role-playing in a Star Wars universe in which the only communication was by text, and in which everyone was more Porkins than Han Solo.